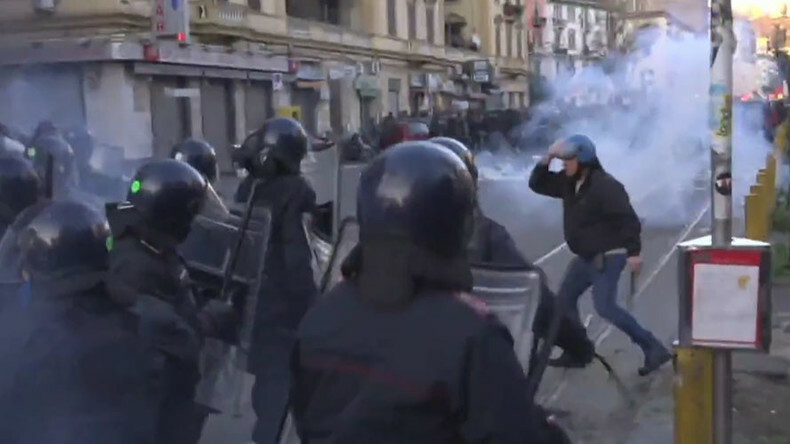 Dozens of masked protesters engaged in running battles with the police in the southern Italian city of Naples, outside a rally by the anti-immigration Lega Nord politician Matteo Salvini. Police unleashed water cannon and tear gas on protesters, who launched projectiles and flares. The heart of Italy’s third-biggest city was covered in thick smoke, as police used batons to fend off the rioters, who themselves had improvised clubs, and threw bins and other street objects at the law enforcement officers in a series of anarchic clashes, as the protesters retreated and rushed the cordons again and again. The protests, which local media suggested were planned by left-wingers, anarchists, and radical football fans called the Ultras, were announced ahead of Salvini’s visit and, on Friday, a group had already occupied the hall where he was scheduled to address supporters the next day. “Naples doesn’t want you,” read slogans addressed to the politician, who had never organized a mass demonstration in the traditionally left-leaning city. On Saturday, as many as 3,000 people started off an initially peaceful demonstration, shouting slogans that accused Salvini of being “racist and xenophobic,” while some hired a bulldozer that would symbolically clear away the Lega Nord leader from Naples. Salvini said that his rally would go ahead, and that he was not deterred by “a few rich kids protesting,” after previously engaging in a war of words with the city’s mayor, Luigi De Magistris, over the venue for his rally. As the protests continued to rage, he began his speech to rapturous applause, and photos posted from the Lega Nord gathering gave no hint of the troubles in the city. Lega Nord advocates similar anti-EU, anti-immigrant, and anti-Muslim positions as fellow right-wing parties such as the National Front, but is different due to its regionalist position. The party, which has grown out of the well-off, industrialized north, is against the income distribution in favor of the poorer south of the country, another explanation for the cool reception in Naples. Ahead of the visit, Salvini, whose Lega Nord party is polling at about 14 percent, ahead of a likely parliamentary election later this year, laid out his vision for a federalized Italy, with greater self-government for every region. "Naples was a world capital before Roman centralism robbed it of everything and everyone, we want to make Italy beautiful and varied," Salvini, 44, told assorted reporters.